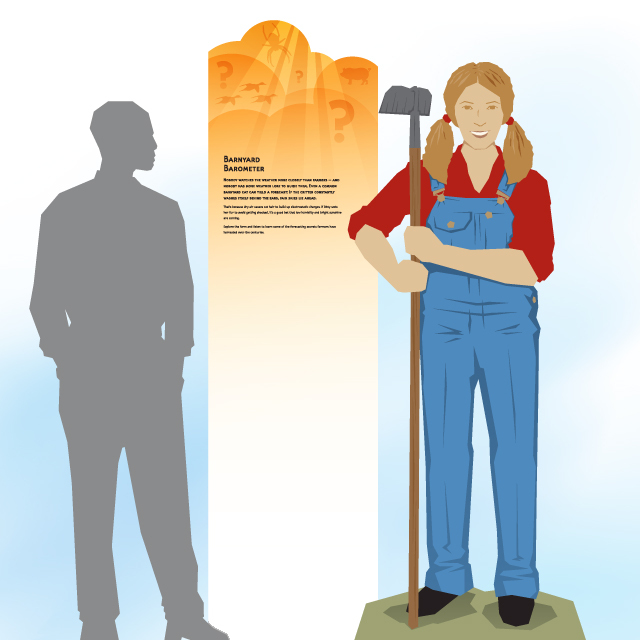 Rarely has work been so fun as when Gene had the opportunity to develop graphics for the Weather Discovery Center in Punxsutawney, Pennsylvania! The PWDC is located in a re-purposed post office and uses the legendary Punxsutawney Phil as a vehicle for weather education. 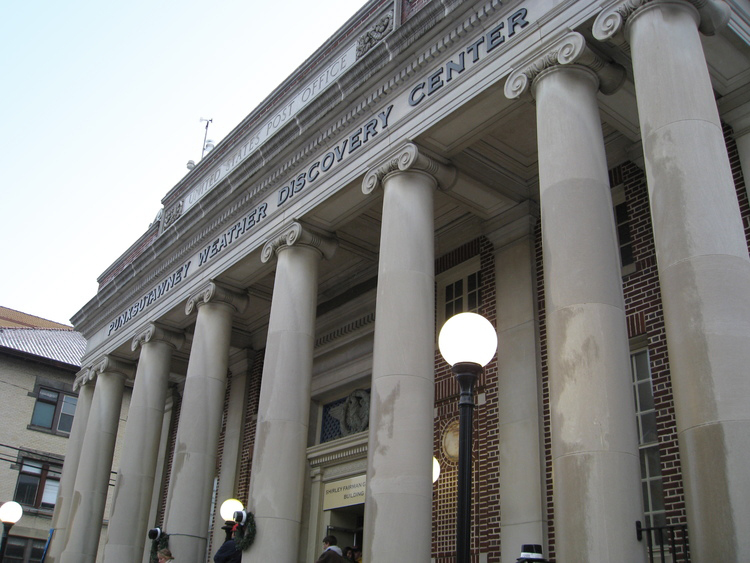 Visitors to the PWDC are treated to a collection of postal artifacts, the Meteorologist Hall of Fame, Phil’s Burrow and a host of interactive exhibits. 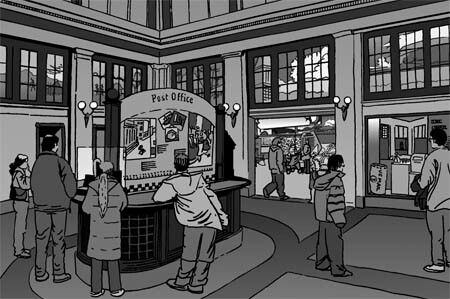 The PWDC makes its home in this retired regional post office. Punxsutawney Phil, of Groundhog Day fame, is quite a popular rodent. This thematic graphic show a couple of his biggest fans. Three of nine large translucent window graphics in the lobby of the Punxsutawney Weather Discovery Center are shown here. 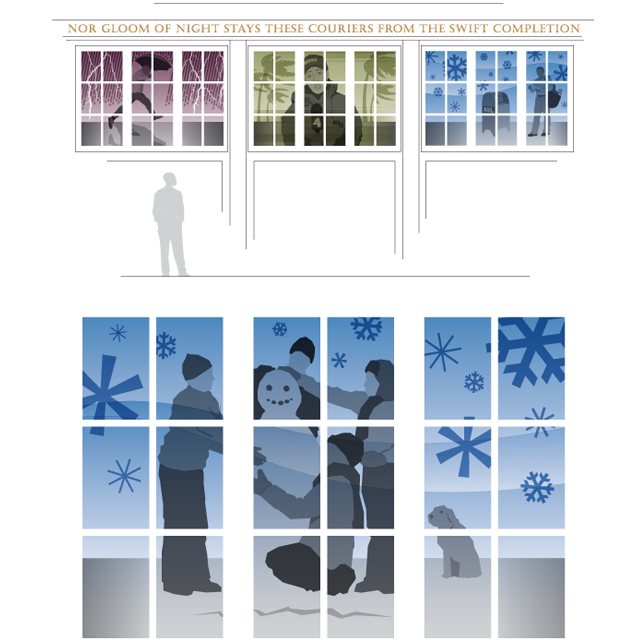 Each graphic illustrates a different weather condition and a person interacting with that weather. 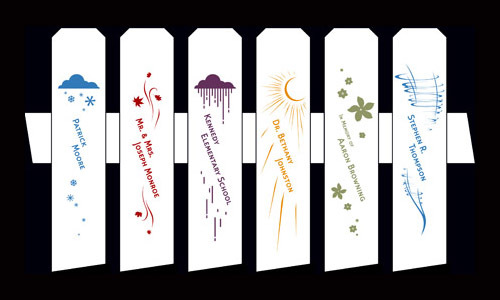 These overhead banners coordinate with interactive exhibits and absorb echoes within the PWDC’s main gallery. 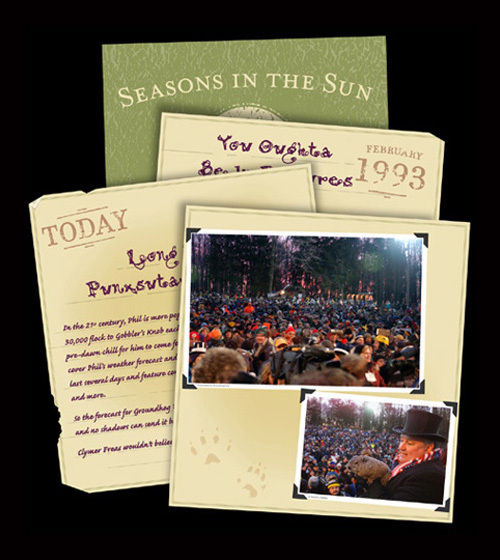 A few pages from Phil’s scrapbook illustrate the history of Groundhog Day in an engaging format. 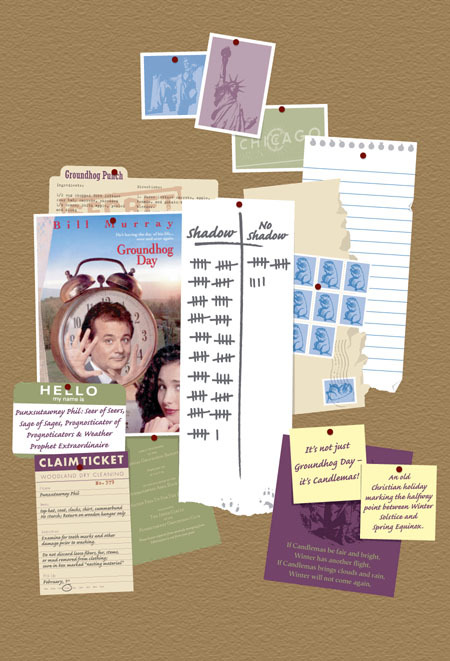 Phil’s bulletin board references the roots of Groundhog Day, Phil’s place in pop culture and local lore. 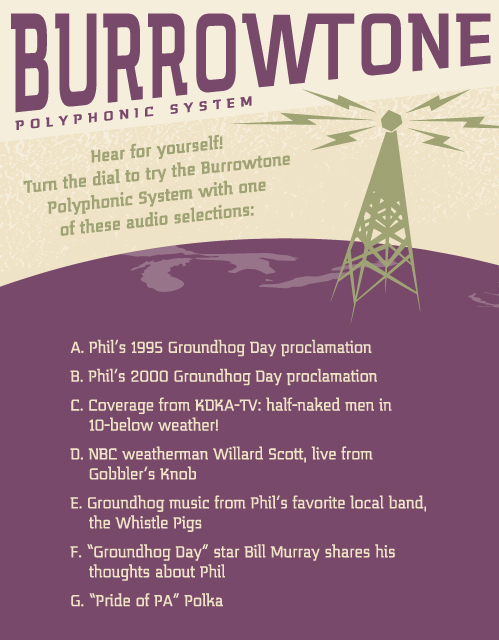 This graphic was designed to accompany a themed interactive radio exhibit in Phil’s burrow. The radio allows visitors to play clips of Groundhog Day related audio. This interpretive graphic explains how weather lore is often rooted in solid scientific fact. It also reinforces the visual identity of the PWDC. 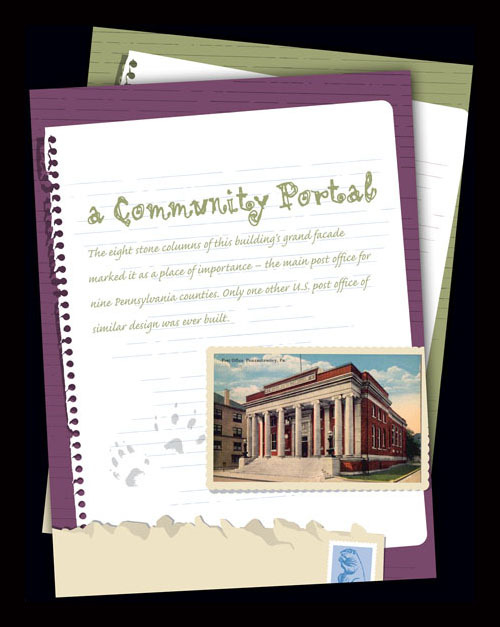 A series of letters throughout the museum describe the history of the post office building and its connection with the PWDC. These graphics were designed to accompany an interactive exhibit geared toward young children that describes the formation and impact of tornadoes. Custom typography and illustration combine with visually textured graphics to communicate urgency. 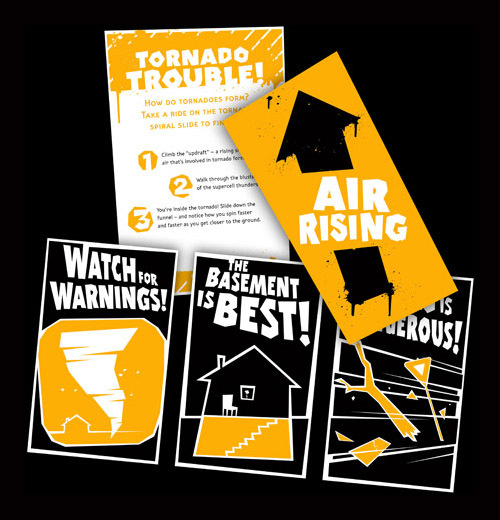 These, like the tornado thematic graphics, accompany an interactive exhibit. In the exhibit visitors, as a group, create a “thunderstorm” by pounding drums, turning fans and triggering a light show. The design of these graphics reflect the urgency and excitement of thunderstorms. 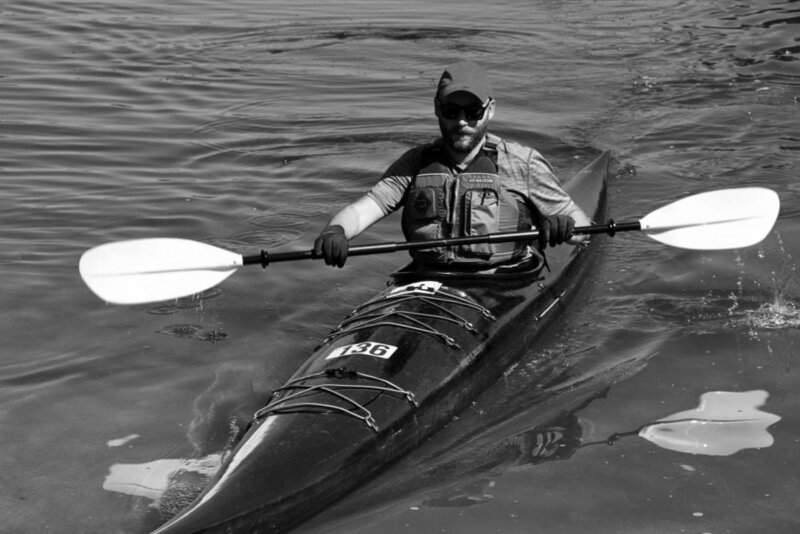 Fence pickets provide an opportunity for the PWDC to recognize their generous supporters. The original concept sketches, above, depict the bustling educational environment that is the PWDC.